Pluteus cervinus, the Deer Shield, was for many years commonly known as the Fawn Pluteus. In most parts of Britain and Ireland this is by far the most common of the shield fungi, most of which are very infrequent or rare finds.. In common with other mushrooms of the Pluteus genus, the Deer Shield is a wood-rotting fungus that occurs mainly on hardwood stumps. This fungus can appear at any time from late spring through to late autumn. Although its caps are usually fawn or light brown, like the coat of a young deer (referred to as a 'fawn' regardless of its colour! 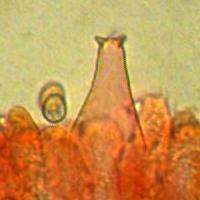 ), some authorities say that the common name comes not from the brown colour of the cap but from antler-like horn-shaped protrusions on apex of the gill-face cystidia (known as pleurocystidia). Some mycologists recognise a number of varieties of the Deer Shield, and among these is Pluteus cervinus var. scaber J.E. 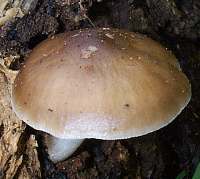 Lange which, as the name suggests, is more scaly or fibrous than the nominate variety of the Deer Shield Pluteus cervinus var. cervinus. The drought-cracked swarthy-stemmed Deer Shield mushroom shown above was seen growing at the bese of an old Beech tree in West Wales in late April 2014. This is the earliest date that I have ever found Pluteus cervinus and I was very dubious about the identification until I checked that the gills were free of the stem; I then made a spore print, measured the spores, and looked at the horned gill-face cystidia under a microscope, all of which keyed out to the Deer Shield Pluteus cervinus., and so I infer that this is the variety that J E Lange described as Pluteus cervinus var. scaber. Originally described in 1762 by Jacob Christian Schaeffer, who called it Agaricus cervinus (most gilled fungi were placed in one gigantic Agaricus genus in the early days of taxonomy), the Deer Shield was given its present scientific name by the famous German mycologist Paul Kummer in 1871. 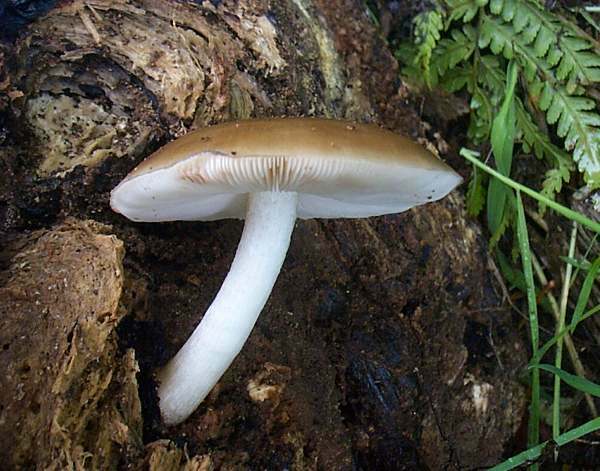 Synonyms of Pluteus cervinus include Agaricus cervinus Schaeff., Agaricus pluteus Batsch, Agaricus atricapillus Batsch, Agaricus curtisii Berk. 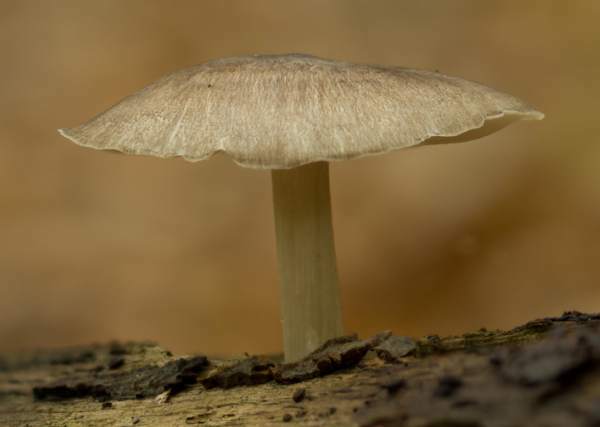 & Broome, Pluteus curtisii (Berk. & Broome) Sacc., Pluteus bullii (Cooke) Rea, and Pluteus atricapillus (Batsch) Fayod. 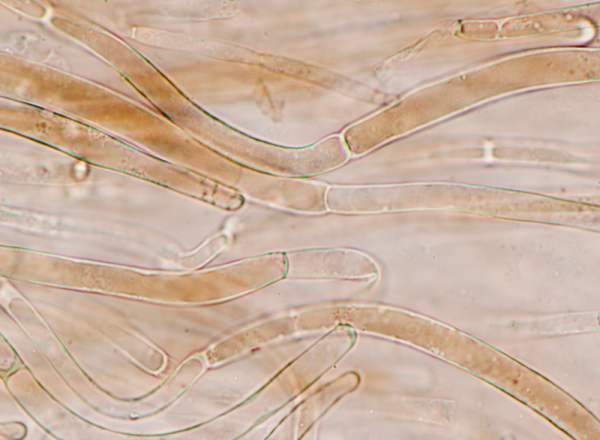 Pluteus, the genus name, comes from Latin and literally means a protective fence or screen - a shield for example! 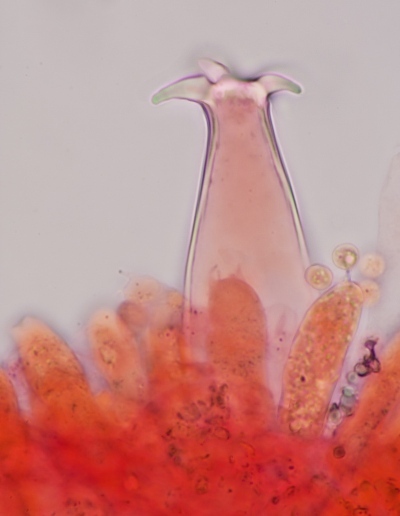 The specific epithet cervinus comes from the Latin cervus, a deer, and is most likely a reference not to the fawn (deer-like) colour of the caps but to antler-like 'horns' on the tips of the gill-edge cheilocystidia - sterile cells on the edges projecting from the edges of the gills. Sepia to dark brown, usually with slightly darker radial streaks, caps of the Deer Shield are convex at first and then flattened; smooth, with a fibrous surface. The cap flesh is white and firm. 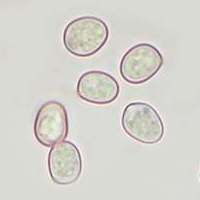 A cutis or ixocutis of pale brown filamentous hyphal elements typically 5-10µm diameter; terminal cells cylindric or slightly clavate; clamp connections absent. 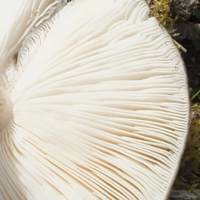 White at first, becoming pale pink, the gills of Pluteus cervinus are broad, crowded and free. The stipe or stem of this woodland fungus is white, sometimes with dark longitudinal fibres, and of even diameter or very slightly bulbous at the base. The stem flesh is white and firm, and it does not become hollow as it ages. Ellipsoidal, smooth, 6-8 x 4-6µm. 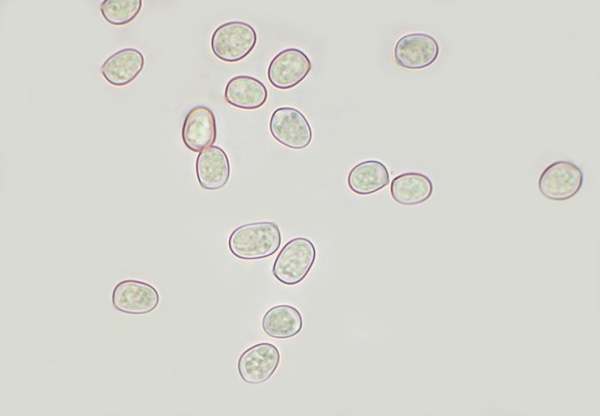 Cystidia on the gill edges project well beyond the basidia; they are ornamented with 'horns' - see left - from which the Deer Shield gets both its common name and the specific epithet cervinus. Saprobic, solitary or in small groups on stumps, rotting fallen branches and other woody debris of broad-leaf trees, this wood-rotting fungus is also found very occasionally on conifer stumps. Pluteus cervinus appears quite commonly on damp sawdust heaps along with many inedible brown toadstools. Fruiting in Britain and Ireland through most of the year, provided the weather is mild, the Deer Shield is most abundant during summer and autumn. 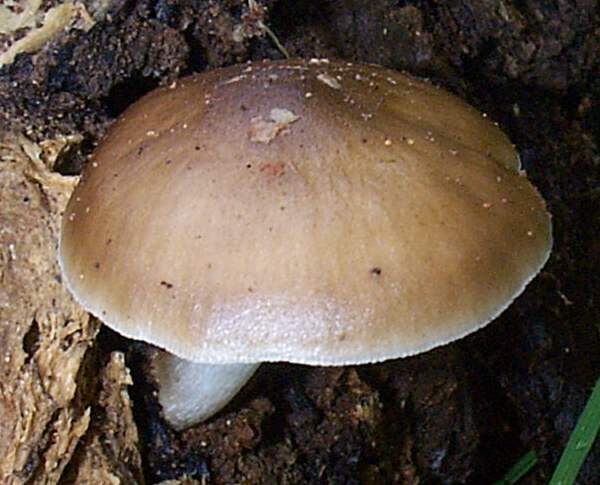 Pluteus umbrosus has a wrinkled cap and is generally smaller. The Deer Shield is reported in many field guides to be an edible mushroom, although it is not highly rated and there are reports of some people being ill after eating this species. We therefore recommend that Pluteus cervinus should not be gathered for eating. Alfredo Justo, Andrew M. Minnis, Stefano Ghignone, Nelson Menolli Jr., Marina Capelari, Olivia Rodríguez, Ekaterina Malysheva, Marco Contu, Alfredo Vizzini (2011). 'Species recognition in Pluteus and Volvopluteus (Pluteaceae, Agaricales): morphology, geography and phylogeny'. Mycological Progress 10 (4): 453–479. Orton, P.D. (1986). British Fungus Flora: Agarics and Boleti. Vol 4. 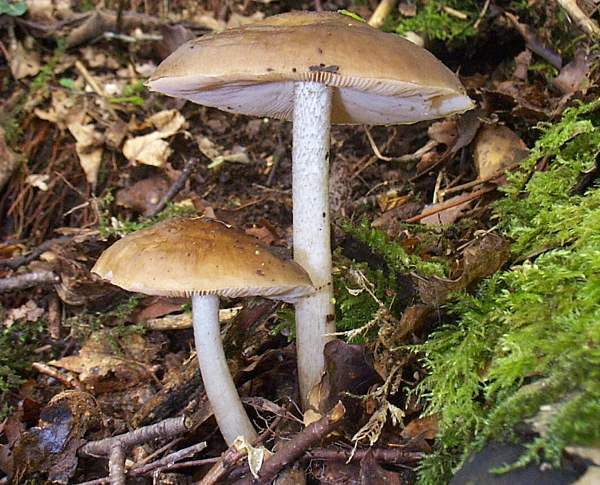 Pluteaceae: Pluteus & Volvariella. Royal Botanic Garden: Edinburgh, Scotland.